Today's consumers of portable electronics consumers are demanding devices not only deliver more power but also work healthy for the environment. This fact alone has lead major corporations like Intel, BIC, Duracell and Microsoft to believe that Microfuel Cells could be the next-generation power source for electronic products. Compact and readable, Microfuels Principles and Applications, offers engineers and product designers a reference unsurpassed by any other in the market. The book starts with a clear and rigorous exposition of the fundamentals engineering principles governing energy conversion for small electronic devices, followed by self-contained chapters concerning applications. 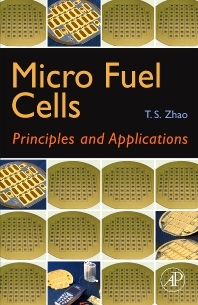 The authors provide original points of view on all types of commercially available micro fuel cells types, including micro proton exchange membrane fuel cells, micro direct methanol fuel cells, micro solid oxide fuel cells and micro bio-fuel cells. The book also contains a detailed introduction to the fabrication of the components and the assembly of the system, making it a valuable reference both in terms of its application to product design and understanding micro engineering principles. An overview of the micro fuel cell systems and applications. A detailed introduction to the fabrication of the components and the assembly of the system. *Original points of view on prospects of micro fuel cells. Introduction Fundamentals of Energy Conversation for Micro Fuel Cells Chapter 1 Micro Fuel Cells S. R. Narayanan Jet Propulsion Laboratory, Pasadera, CA, USA. Chapter 2 MEMS-based micro fuel cells: promising power sources for portable electronics T. Pichonat Laboratoire FEMTO-ST, Département L.P.M.O., U.M.R. 6174, 32, Avenue de l'Observatoire, 25044 Besançon Cedex, France. Chapter 3 Micro Proton Electrolyte Membrane (PEM) Fuel Cells S. S. Hsieh Department of Mechanical and Electro-Mechanical Engineering, National Sun Yat-Sen University, Kaohsiung, Taiwan, ROC. Chapter 4 Membranes and Fuel Cells for Low-Power Wireless Devices P. A. Kohl School of Chemical and Bio-molecular Engineering, Georgia Institute of Technology Atlanta, GA 30332, USA. Chapter 5 Development of Fabrication/Integration Technology for Micro Tubular SOFC T. Suzuki Advanced Manufacturing Research Institute, National Institute of Advanced Industrial Science and Technology (AIST), Nagoya, Japan. Chapter 6 Enzymatic Fuel Cells S. D. Minteer Department of Chemistry, Saint Louis University, St. Louis, Missouri 63103, USA. Chapter 7 Glucose biosensors S. P. J. Higson Cranfield Health, Cranfield University, Silsoe, Bedfordshire MK45 4DT, UK.